That's a Level 4 claim on the baloney scale. Canada's Prime Minister Justin Trudeau answers questions from the media in Montreal on Aug. 8, 2018. 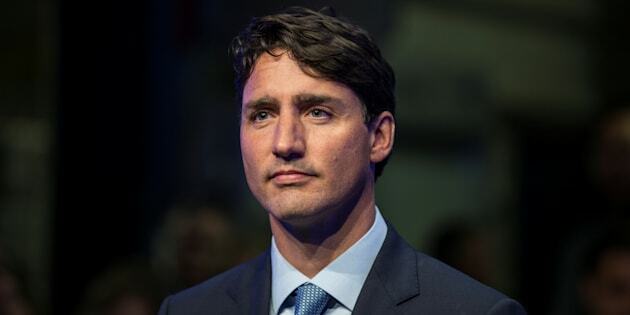 OTTAWA — "Since we formed government, the Canadian economy has created over 60 per cent more full-time jobs than the Conservatives did over the same time period.'' — Prime Minister Justin Trudeau, Aug. 14, 2018. It's an important exercise in spin for a government whose central brand is about convincing Canadians that "the environment and the economy go hand-in-hand'' — that fighting climate change, in other words, needn't come at the expense of economic growth. This one earns a rating of "a lot of baloney.'' Here's why. Officials in the Prime Minister's Office pointed to Employment Minister Patty Hajdu's office to provide a breakdown of how Trudeau came up with that 60 per cent figure. Calculations by CP confirmed the data provided by Hajdu's office: 542,500 new full-time jobs between October 2015 and July 2018, and just 322,300 new jobs between January 2013 and October 2015 — a difference, for the record, of 59.4 per cent. But there's more to the claim than just the numbers. Any suggestion that the Liberals are "somehow responsible'' for those numbers confuses the sequence of events with causality, said Stephen Gordon, an economics professor at Laval University. "The fact that this is done so often doesn't make it any less wrong,'' said Gordon — no fan, he said, of using such statistics to suggest that the arrival of any new government results in more jobs. Stephen Harper waves as he walks off the stage after giving his concession speech in Calgary on Oct. 19, 2015. "If you're going to argue that the arrival of a Liberal government leads to increased employment, you might as well argue that the arrival of a Conservative government has an even stronger effect on employment,'' Gordon said. Governments often "claim credit for — and take blame for — economic performance for which they often have little control,'' added Emmett Macfarlane, a political science professor at the University of Waterloo. During the Conservative government's first 33 months in office, the economy was booming, while their last 33 months included a collapse in oil prices, she noted. Indeed, by contrasting their first 33 months with the Conservative government's last 33 months, they are effectively comparing apples and oranges.